“We need to know why the government still taxes sanitary products on luxurious, non-essential grounds, but not helicopters, the maintenance of our private jets, or crocodile steaks,” Laura Croyton wrote in the Change.org campaign she launched in March 2014. Like other EU countries, Australia and many US states, Croyton’s native Britain has a tampon tax: a tax that treats female sanitary products as non-essential luxury items. The ongoing protests surrounding this levy demonstrate how ridiculous it is to consider tampons and sanitary towels a “luxury”. And yet, for 82% of women and girls around the world, they are very much a luxury – one which they can’t afford or access. In places like India, where menstrual taboos run deep, 70% of women rely on old rags to get them through their periods. In Syrian refugee camps, even though families receive coupons for buying the essentials, these don’t cover sanitary products. Women are forced to trade in their belongings to pay for them or make do without. As UNICEF research has shown, when women and girls lack access to sanitary products, they’re more likely to suffer from health issues such as vaginal and urinary infections. It can even affect maternal mortality. But the problems don’t stop there. 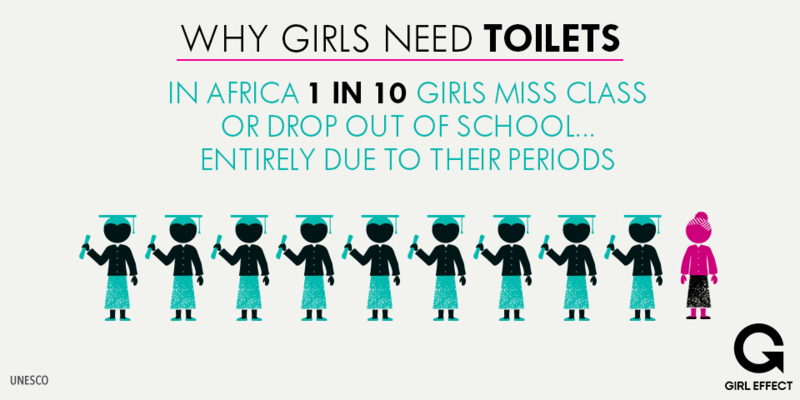 According to research from Girl Effect, 1 in 10 girls in Africa miss class or drop out of school all because of their periods. At the country level, the figures can be even more shocking. In Sierra Leone, more than 1 in 5 girls miss school because of their periods. In Nepal and Afghanistan, 3 in 10 girls do. Research has demonstrated the positive effects of universal education: educated women are less likely to die in childbirth, their babies tend to be healthier, and their children are in turn more likely to go to school. As UNICEF points out, “it creates a ripple effect of opportunity that influences generations to come”. But there are solutions – coming from unexpected places. In 1998 in India, a newly wed Arunachalam Muruganantham realized his wife was having to forgo sanitary products so they could afford food for the family. He set about building a low-cost machine that women in rural communities could use for making and selling sanitary towels. Almost two decades after he first produced the machine, 110 countries are using the design and a British social entrepreneur is bringing it to Jordan’s largest refugee camp, home to around 81,000 Syrian refugees. Muruganantham has refused to sell his product to the corporate world and instead hopes it will not only make sanitary products affordable, but also provide a livelihood for thousands of women and help even more girls complete their education.